I have to confess, I am “directionally challenged”, I can lose my way frighteningly easily. When out on long hacks alone I have been known to resort to dropping the reins & letting the horse navigate its own way back to the yard. This technique worked well until one afternoon when a fully loaded hay lorry passed my spectacularly greedy mare, and she set off in hot pursuit – a case of meals on wheels? So, how useful is this? 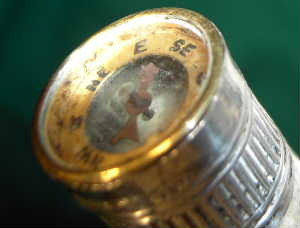 A whip or crop with a compass – the compass still works, which isn’t bad considering that the silver mount is hallmarked Sheffield 1889, making it 120 years old. The grip is made of staghorn or antler, and there is a second silver collar at its lower edge. The shaft or stock is probably whalebone, but much more rigid than in many sidesaddle whips. It is covered in braided linen which has been lacquered. The lash at the end is definitely a replacement, a sort of tassel of leather. I will probably have it replaced with a leather keeper or silk lash. This entry was posted in Antique Whips, Uncategorized and tagged compass, crop, riding whip. Bookmark the permalink.